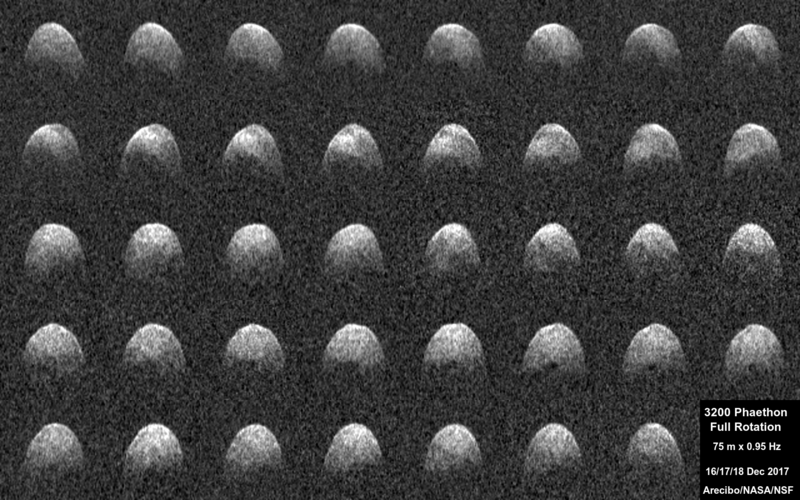 Arecibo radar images from 16-18 December 2017 showing the full rotation of asteroid 3200 Phaethon with resolution of 75 meters (250 feet) per pixel. Time increases from left to right and top to bottom such that Phaethon appears to rotate counterclockwise. The shape is roughly spherical and shows only subtle surface features at this resolution. 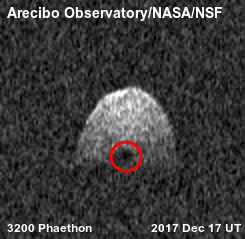 Arecibo, Puerto Rico - December 22, 2017 - After several months of downtime since Hurricane Maria struck the island of Puerto Rico, the Arecibo Observatory Planetary Radar has returned to normal operation, providing the highest-resolution images to date of near-Earth asteroid 3200 Phaethon during its December 2017 close approach to Earth. The radar images, which are subtle at the available resolution, reveal the asteroid is spheroidal (roughly ball-shaped) and has a large concavity, or depression, at least several hundred meters in extent near its equator, and a conspicuous dark, circular feature near one of the poles. Arecibo’s radar images of Phaethon have resolutions as fine as about 250 feet (75 meters) per pixel. (left) Animation of the Arecibo radar images from the above figure showing the full rotation of Phaethon. (right) Still frame showing the circular, radar dark feature, highlighted in red. Tracking and characterizing PHAs is a primary mission of NASA’s Planetary Defense Coordination Office. Radar is a powerful technique for studying asteroid sizes, shapes, rotation, surface features and roughness, and for more precise determination of their orbital path, when they pass relatively close to Earth.